Your brain is under a lot of pressure to perform. It’s estimated that during the typical lifetime, the human brain will process and hold a quadrillion pieces of information. Yes, that beautiful brain of yours, weighing only about three pounds can hold an unfathomably large database of information. It’s no wonder that we misplace and lose things in there every now and then. But, just because a memory is misplaced doesn’t mean that it’s gone forever. In fact, everything that you have ever learned and experienced is tucked away in there somewhere. And, yes, this includes the telephone number you can never remember or where you last left your car keys. What would your life be like if you were more easily able to recall information that you thought was gone forever or if you had less difficulty remembering important details? Would you be less stressed? More productive? Maybe even have a greater self confidence or be able to focus on healing past hurts that refuse to come to the surface? Memory function has a much bigger influence on your life than you might think. Sure, it would be nice to never need to go back out to get the one thing on your shopping list that you forgot…again, but the truth is improved memory can change your life in very significant ways. Enter hypnosis. There are many tips and tricks out there for improving memory function with hypnosis. Some of them work great, some of them not so much. 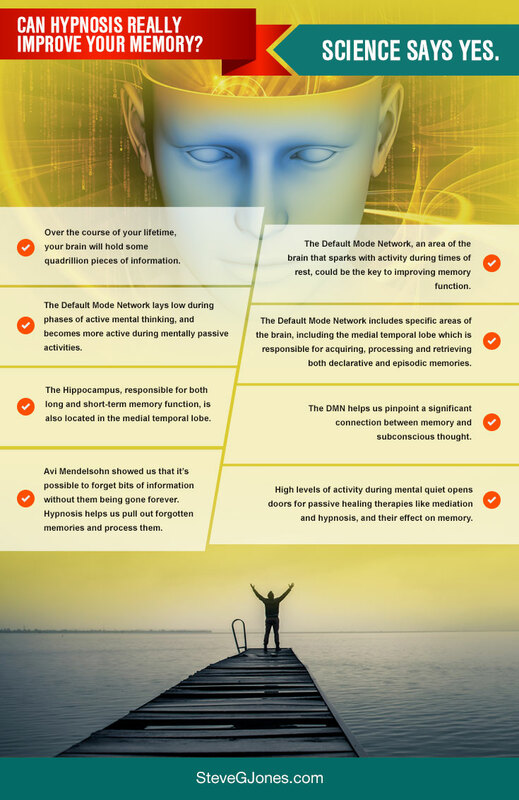 The challenge with the methods that don’t work is that, unlike hypnosis, they don’t tap into regions of the brain, called the default mode network that are responsible for memory function. So, would you like to improve your memory function? Of course, you do. But, I’m not going to try to sell you on hypnosis to do the trick without first explaining to you how it works. Let’s start by taking a look at the default mode network and its role in memory function. The effect of hypnosis on memory begins with an area of the brain called the default mode network, or DMN. In the simplest terms, the DMN is an interconnected group of brain structures that work together as part of a singular functional system. While the concept of the DMN has been around since the 1920s, scientist largely discredited the idea. That was until the late twentieth century, when technology was able to back the hypothesis with scientific evidence that had been previously lacking. By 2001, the Default Mode Network had lit up the neuroscience community. The reason that the default mode network has made so many waves is that it is an area that reacts completely differently than what we previously thought we knew about brain function. This group of brain regions show reduced levels of activity when we are engaged in thoughtful tasks that require concentration. For example, if you’re studying for an exam or playing a strategic board game, your default mode network is going to be laying low, showing little activity. However, those moments when you aren’t focusing, and not involved in any type of mental exercise, the default mode network springs to action with a flurry of activity. Daydreaming, people watching, and any other time that you are passively thinking about something is when the DMN regions of your brain are going to show the most activity. In other words, when all is quiet, the DMN is hard at work. The amazing thing about the default mode network is it’s therapeutic potential, most of which we have yet to discover. Here we have regions of the brain that are highly sensitive during times of rest and low input. This shows us that there is incredible potential for more passive healing therapies, like meditation and hypnosis. The areas of the brain that are included in the default mode network are the medial temporal lobe, the medial prefrontal cortex, the posterior cingulate cortex and parts of the parietal cortex, among others. Unless you are a neuroscientist, or possibly a brain surgeon, those words might not mean much too you. But they’re important for understanding the effect of hypnosis on memory. Each of these regions is associated with some level of internal thought. Of these, when it comes to increasing memory, we are most interested in what’s going on in the medial temporal lobe during hypnosis. The medial temporal lobe, is the inner part of the temporal lobe, near the divide of the two hemispheres of the brain. This part of your brain houses the limbic system, including the hippocampus, amygdala, the thalamus and other structures that are critical players in memory function. The medial temporal lobe is responsible for acquiring, processing and retrieving two different types of memories. These two types are declarative memories and episodic memories. Let’s take a minute to talk a little bit about each. Declarative memory, also called explicit memory, is memory of conscious thoughts. It’s the recollection of facts and events that can usually be proven or disproven. Declarative memory is what you are counting on when you’re studying for an exam or trying to recall the names of your new coworkers on day two of your new job. Declarative memory is based on certain events or series of actions in your life. Examples of declarative memory include the ability to recall the color of the flowers at your cousin’s wedding, or the name of every South American nation. Declarative memory is also behind the ability for you to recall your great grandmother’s famous cookie recipe without looking or the names of each of the eight members that were in your scout troop two decades ago. Next, we have episodic memory. Episodic memory is different from declarative memory because it is based on an individual’s senses and perceptions. A person’s episodic memories of a specific situation are often very different from someone else’s. Say for example that you went on a ski trip with a group of friends. Depending on individual preferences and perceptions, you might say that the weather was chilly, but sunny and perfect for skiing. Your friend’s recollection might be that it was bitterly cold. The fact is that while you both have different memories, they are both accurate for the individual and neither is wrong, although you might disagree about it for years to come. Episodic memories can also include factual information that can be recalled through sensory stimulation. Emotion often plays a role in the formation of episodic memories. For example, you might use the elevator multiple times a day at work, and no one time is different from any other, so you don’t acquire any specific memories to differentiate one elevator ride from the next. Until the day your coworker goes a little too heavy on the cologne. The next time you smell that cologne, you will likely be able to recall the details of that specific time in the elevator, including what you were wearing and who was in the elevator with you. In addition to all of this, the hippocampus, also found in the medial temporal lobe is responsible for both short term and long-term memory function. It also has the prestigious designation of being one of the few areas of the brain that is capable of growing new neurons. The medial temporal lobe, a major region of the default mode network, is a memory powerhouse and key to increasing memory through hypnosis. So, we now know that times of decreased, conscious thought light up the default mode network regions of the brain. What’s even more interesting is that we can compare DMN activity among people at rest, and by rest we mean not actively engaging in any activity involving active, conscious thought, and see that even among those cases there are distinct difference in DMN activity. It seems that the less aware a person is of their thoughts or action; the more activity actually occurs in the area. For example, you might be mindlessly daydreaming and recall certain details about a situation, but if you were to be laying around half asleep and the very same thoughts came to your mind, you might be able to recall more. This indicates that there is significant connection between memory and subconscious thought. During hypnosis the goal is to reach a natural state of selective, focused thought. When we put it like that, it almost seems as hypnosis might be counterproductive to engaging the areas of the brain that are active in memory formation and activation. However, the opposite is true. The focused thought that someone has during hypnosis is quite different from normal active, focused thought. Hypnosis, when done properly, relaxes you to the point that your default mode network becomes more highly engaged. It’s during this time, when you are calm and in a state or relaxation that you become open to being guided through focused thought at the very same point that the areas of your brain that are responsible for memory are activated. You are in a state of focused thinking, but at the same time, there is a disconnection between your thoughts and an awareness of your thoughts. The best way to describe this is by comparing it to a focused activity that you really enjoy. One example might be knitting. If you’ve ever tried knitting, or even watched someone as they furiously worked their needles back and forth, it’s obvious that it’s a multistep process that requires thought, action and learning. But, for someone who has been doing it forever, they can do it almost thoughtlessly. How many times have you heard someone say that they love an activity because it helps them relax and zone out? Focused thought is still occurring, but you are not actively aware of it, and you can easily recall what steps come next without thinking about it. Hypnosis works in a similar way. You are focused, but relaxed enough that you can tap into your memory with little to no effort. There is an endless list of reasons why we forget things. Sometimes, there is an injury or emotional trauma that results in memory loss. Other times stress, lack of sleep, health issues, distraction or any number of things can come into play and interfere with our ability to effectively recall memories. We all have our own reasons for wanting better access and control over our memories. Maybe there is something from your past that you want to work on healing, and you just can’t reach that point without accessing memories buried far beneath the surface. Or, it could be that you’ve just noticed that your memory isn’t as sharp as it once was, and you miss be able to recall memories with your typical ease. While the reasons might be personal, the truth is that improved memory can enhance everyone’s life, regardless of their individual circumstances. Hypnosis can not only assist you in recalling memories, but also help you in processing those memories in a therapeutic setting. Through hypnosis, you can uncover memories that you thought were long forgotten, and even ones you never knew you had. But also, you instinctively learn to adapt how you process information, meaning that better memory retention comes as a natural “side effect” of regular hypnosis practice. Through hypnosis, you are gently guided to a place where you focused, yet open enough, to allow your conscious mind to dig around in those areas of hidden memory. You will essentially improve your memory from the inside out. Once upon a time, the idea that hypnosis can change the way the way your process and retrieve information. Today, with scholarly research, backed up by medical technology, we now know without question that hypnotic techniques used to impact memory create very real, very measurable changes in the default mode network of the brain. One of the most interesting things about hypnosis for memory is that when you work with an expert in the field, they should be able to help you to both recall, and temporarily forget, specific details. It’s an incredible paradox that was researched by Avi Mendelsohn with impressive results. While it may not have been his initial intention, with this study he was able to prove that that the human brain can forget bits of information, without them being gone forever. All you need is a tool that enables you to recover memories and pieces of information, no matter how important, or seemingly insignificant. Depending on the reasons behind your interests in using hypnotherapy to improve your memory, you might want to use it in conjunction with other modes of therapy. For example, if you feel that you have a decline in memory function that stems from an emotional trauma, it’s not a bad idea to work with an additional therapist to further help you in processing and neutralizing some of the unpleasant emotions that might result from your recalled memories. The important thing to remember in a situation like this is that you are on a path to healing and wholeness, and hypnotherapy is just one therapeutic means of helping you get there. But, let’s say that you are approaching this from the perspective that you just want to feel a little sharper. You want to more easily be able to remember and recall facts and details that you encounter during your typical day. Hypnosis can help you build a memory that will stay strong into the future. Hypnosis will give you the tools to help you naturally enter a state where your brain is more receptive and open to information. You will learn how to relax, so that can remember or recall anything while under pressure. 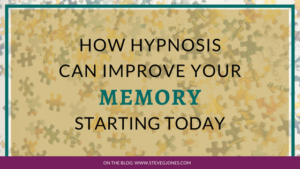 Hypnosis will also help improve your memory by instilling you with the ability to overcome pressure, tension and stress in order to further develop your memory capabilities. Many times, when someone is interested in hypnosis for improved memory they are only thinking of the present and the immediate future. There is something they want to remember, or something that they don’t want to forget that is fueling their interest. What many people don’t realize is that improved memory through hypnosis can have a positive effect on your life for years to come. Think about it for a minute. What would it mean to you if you were somehow able to master a new task with ease because you instantly remembered every bit of the instructions? What if you were able to recall hidden memories and learn from them in ways that lead to you living a more beautiful and authentic life? Wouldn’t each day be a little more fulfilling for you on all levels? Here we are talking about hypnosis, which even with scientific backing, still has a bit of a mysterious air about it. Then we add the possibility of potentially uncovering unknown secrets about yourself. You might think it all sounds a little too uncomfortable. It’s ok, I get it. I know where you’re coming from, and I’m here to tell you there’s nothing to fear and everything to gain. Professional hypnosis is not going to leave you feeling emotionally vulnerable in any way. You are the one that’s in control the entire time. Think about that. You, and you alone, have the potential to take control of your past memories and build your memory power for the future. I dare you to tell me that doesn’t sound like an enticing proposition. There’s no reason to hide from your memories or let something stand in the way of improving your memory function in the future. It’s important for you to know that hypnosis is a professional therapy that yields professional and effective results. It doesn’t matter how old you are, where you are in your life or what has happened in your past. Hypnosis is an effective way of engaging with the regions of your brain that are in control of your memory function. There’s absolutely nothing to fear, so what are you waiting for? P.S. Here is a free hypnosis session, designed to help you improve your memory. It does not contain music or binaural tones (my memory enhancement hypnosis mp3 download does).